Professor Dr Christina Richards BSc (Hons), MSc, DCPsych, CPsychol, EuroPsy, FBPsS is an HCPC Registered Doctor of Applied Psychology and a full Fellow of the British Psychological Society (BPS) where she is the current Chair of the Division of Counselling Psychology; Committee member for Psychologist Prescribing; Lead National Assessor for Counselling Psychology; and Chair of the revision committee of the BPS Guidelines for working therapeutically with sexual, gender, and relationship diverse clients of which she was a co-author. Professor Richards is Visiting Full Professor of Gender and Mental Health at Regent’s University London School of Psychotherapy and Psychology. 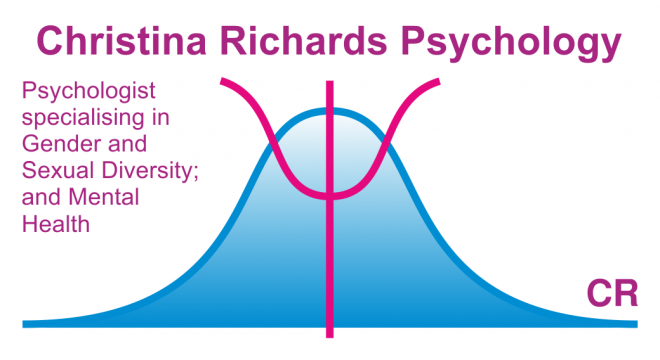 Prof. Richards is Lead Consultant Psychologist/Head of Psychology at the London Gender Identity Clinic (Charing Cross) within the Tavistock and Portman NHS Foundation Trust. This role involves strategic planning and management on a national and international level; supervising senior staff; assessing people with highly complex needs for hormones and surgeries, and supervision of individual and group therapies from a number of different modalities. Prof. Richards is also Head of Research at the NHS London Gender Identity Clinic (Charing Cross) within the Tavistock and Portman NHS Foundation Trust. This role involves responsibility for the strategy and implementation of the research programme at the clinic. Professor Richards also lectures and publishes internationally on gender, sexualities, and critical mental health – both within clinical academia and also to third sector and statutory bodies. Prof. Richards was elected to the Executive Board of the European Professional Association for Transgender Health (EPATH); and was selected by the executive board of the World Professional Association for Transgender Health (WPATH) to be Lead Chapter Author for Adult Assessment in the Standards of Care Version 8 (SoC v8) revision. She also represented the East Midlands to NHS England’s Clinical Reference Group (CRG) on Gender Identity Services; and is listed as an expert in gender diversity by the BPS on the Gender Diversity Specialist Register (whose criteria she co-drafted). She is one of the few psychologists recognised by HM Courts and Tribunals Service as a Specialist in the field of Gender Dysphoria, thus allowing her to prepare medical reports for the Gender Recognition Panel. Prof. Richards is a founder member of the British Association of Gender Identity Specialists (BAGIS); a Trustee of the National LGBT Foundation; a founder member of BiUK and co-author of the Bisexuality Report. Prof. Richards is the Editor-in-Chief of the journal of the British Psychological Society’s Division of Counselling Psychology: Counselling Psychology Review. Her own publications consist of various papers, reports, and book chapters. She is first author of a clinical guidebook on sexuality and gender published by Sage – Richards, C., & Barker. M. (2013). Sexuality and gender for mental health professionals: A practical guide. London: Sage; First editor of the Palgrave Handbook of the Psychology of Sexuality and Gender; First editor of a multidisciplinary book about people who identify outside of the gender binary of male or female – Richards, C., Bouman, W. P., & Barker, M. J. (2018). Genderqueer and non-binary genders. Basingstoke: Palgrave-Macmillan; Sole author of the monograph: Richards, C. (2017). [Monograph]. Trans and sexuality – An existentially-informed ethical enquiry with implications for counselling psychology. London: Routledge; And has an upcoming co-authored book on clinical work with trans and non-binary people for the Royal College of Psychiatrists – Richards, C., & Barrett, J. (forthcoming 2019). Trans and non-binary gender healthcare for psychiatrists, psychologists, and other mental health professionals. London: Royal College of Psychiatrists/Cambridge University Press. Pronouns: She Her, Hers (Pretty much…). Should you wish to you can buy Sexuality and Gender for Mental health professionals: A practical guide. And The Palgrave handbook of the psychology of sexuality and gender.